The electric piano frenzy continues with 78 minutes of library goodness brought to you today, so make sure you return those overdue books and settle back for some Sunday sunshine. From Duncan Lamont's chilled opener "The Apartment" (of 'Sweeney' fame) we move into some flute-laden jazz funk territory for a few tracks, then move into some brazil soundalike tracks beginning with Andre Ceccarelli. Alan Tew's "The Fence" and Stefano Torossi's classic "Fighting For Life" lead us through some wah wah and blaxpo near-tension, before John Cameron's "Half Remembered Daydream" takes us into the centre vocal section of the compilation : for six tracks you can practise your "woo woos", "bu-bu-bu-bu-buhs" and "da da das" - yes folks, welcome to vocalese language school. Alan Hawkshaw and Brian Bennett pick up the pace as we head into an action section that never quite requires us to remove our seatbelts, before Stan Sulzmann and friends drop us down to some jazz, and then the final soft but still uneasy tones of our constant host Alan Tew. LET'S START WITH THE CONFESSION THAT I'M A REGULAR TO YOUR BLOG AND NEVER HAVE LEFT ANY COMMENT - I DON'T PARTICULARLY LIKE A SIMPLE "THANKS" AND I'M NOT VERY GOOD WITH WORDS. ANYWAY, IT'S ONLY FAIR TO LET YOU KNOW THAT THERE IS SOMEBODY IN GREECE WHO LISTENS TO THE KIND OF MUSIC YOU POST AND ENJOYS IT. I'M JUST LISTENING - AS I WRITE - TO THIS COMPILATION AND IT'S GREAT, IN FACT I'M CARRIED AWAY TRACK AFTER TRACK. YOUR COLLECTIONS ARE SO GOOD THAT I WOULD BUY THEM IF THEY WERE ON THE MARKET. SO LET ME SAY - FOR ONCE - A SIMPLE THANKS! amazing blog, peace from beijing. keep spreading that amazing music worldwide! Hi, Simon - thanks a lot . . . I really love your theme-based compilations - they're a real learning experience, for me, plus just fun to listen to, of course. Take care! Incredible as always! You gave me a great mellow Sunday morning soundtrack! Thank You! you've somehow managed to outdo yourself with this one. Another great compilation. I don't listen to a lot of library music but when I do I always mean to check it out further. Alan Tew did the soundtrack to a great UK TV serial titled 'The Hanged Man' in 1975 and some of the music was used in 'The Two Ronnies' comedy series a few years later. Worth trying to get hold of the original. first time/long time. can't wait to check it. awesome work, I've been reading/listening for a year +. More magic thanks so much . Thanks Simon! A consistently engaging listen, and all new to me. I'm guessing, some of the artists are Australian? Very Cool! Thanks for keeping life in blogland interesting. It's greatly appreciated. Simon, your blog is wonderful! I loved the new compilation. I would recommend to listen to it while cooking. To my surprise I discovered it was the perfect combination with a glass of chilled Chablis. Thanks again for the wonderful music. Oh, the two previous compilations were fantastic as well! "All killer, no filler" to coin a cliche but this is about as good as any library comp can get, only better. Transcendentally speaking! Great compilation Simon, many thanks. I want to thank you for the wonderful Chillout CD. I'm about to move to another state, and I will be taking this on the drive. I'm a new regular on your site. Your site is full of GOOD Music that is work while. Not the crap that is being played on today's radio. Thank you for being the voice of REAL Music!! Very Cool Blog ! Thanks for The Music, so nice music!! 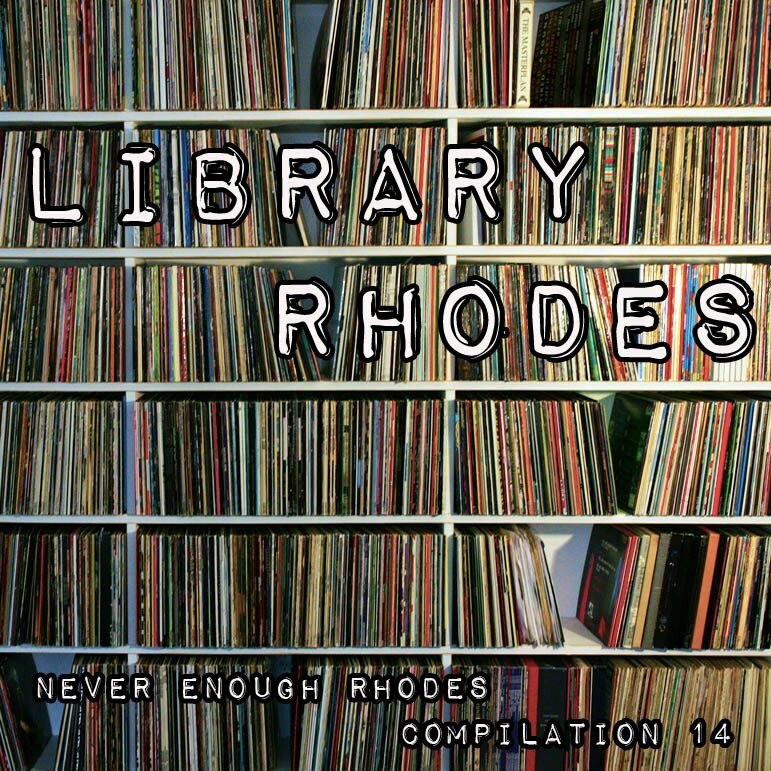 As a fellow Rhodes fanatic, library LP fan, and follower of yours for quite a while now - please keep it up! Simon your too good to us. Serious. This blog is one of my favorite. You post too many gems. Your very much appreciated! I'm in Toronto right now and plan on blasting this all day! Hey, just when I THINK I have a great Jazz vocabulary, you go and change the language. I enjoy your blog immensely. Keep up the good work. This is a totally brilliant compilation. Your fantastic knowledge,music collection & the effort you put in to your Blog to share with everyone is really appreciated. I luv it all especially the tracks with vocalese as well. You keep em coming please!! this looks like a keeper, simon. i miss your regular posts, but we all get distracted from time to time, involuntarily, or otherwise. hope you're well. This compil is near the top that you can find in this genre. THanks so much for all the tasty groove. Simon.....Like others...been listening for a long time; never wrote! Many apologizes----'cause you are the best! Man, you spoil us with compilations that would easily enrich you on the open market----luv that about you, man! Keep up the good work, cuz its obvious that you are about....the craft!! This is great thanks. I'm a big fan ogf Alan Hawkshaw's stuff, in fact do you have a track he did called 'Beach Journey'? It would be great if you could post it. Finally giving this fine mix the air time it deserves. Love that ed motta followed by marcos valle, yes. many thanks for this Simon! oops that was supposed to go in the comments for the brazil rhodes mix. south germany is in the house and totally digging your compilation. I know I'm late to the party on this one but just had to show love for the quality postage...thanks for sharing. Awesome site, awesome tracks-freaking out here! Thanks! I too, have been a frequent visitor here and have never left a comment. I really apologize for that, and I really appreciate all the work and dedication that goes into these posts. The Rhodes comps are fantastic! very very very good compilation. This music made my night. This compilation captures the sound I'm often hunting for, with one great example after another. A real treasure. Hi Simon - love them all really great work! THanks! very cool selection... to get all these tracks in one place, on one compilation... wow! It's true, one can never have enough Rhodes (or funky jazz flute). Some of these tracks are good kitschy fun but others are unironically mindblowingly awesome. Thanks! Hi Simon - wonderful compilation - many thanks & my favourite of the series. Simon, you might not realize it unless you're old enough, but cruisin around in the early 70's in my 1970 Caddy with this stuff playin on a summer night in Chicago... there was absolutely no better soundtrack. Thanks to you, I'm listening, and I'm THERE. Very nice compilation! I drove around the city today pretending I was in a 70s cop show! Your Blg is for me a great DISCOVERY! I'm always looking for the Rhodes, and now i found it! Great music, amazing blog! Greetings from Russia! :) Rhodes is never enough exactly! really thanks very inspired with the sounds ur posting ! thanks . Thanks, you have shown me some new musical territories. Hey. just wanted to say thanks for a great selection of tunes that would have otherwise completely passed me by. Wicked stuff! This site continues to drop constant gems. Thank you. Your compilations are awesome, the selections you made are exceptional. And if this wasn't enough, your creative high-quality artwork is just beautiful (and sometimes humorous :-)! Thank you for sharing! One of the greatest music blogs ever found by me! Respect from Russia! Waiting very much for the next Compilations! grazie mille, sei un grande!!! I want to thank you for such a wonderful Compilation. This is so "chillout" I adore this kind of stuff. Thank you for taking the time to put this together. It's much appreciated. This my favorite of all your comps. Undergroove & Black Light are fantastic. A long belated thanks to you for turning me on to the el. piano. Been enjoying this one since you put it up. At work all the record heads always look up at some of the heavy joints jams and classic key changes when they drop. 5 ways and north bondi kicking it to the never enough Rhodes tip - i should print your address on a card to save my hand. Thank You. One of your best compilations, alongside the ones that are comprised of brazilian songs. this is some powerful stuff i am glad u can find stuff that make u think out the box! keep it up! Wow, this is just terrific. After looking for Fender Rhodes music (JUST Fender Rhodes music) for a while now, I stumbled over your blog and am loving the Rhodes collections! Thankyouthankyouthankyou! Thank you for this gem!!!!! Thanks for this mix! I found you from a funny interview: Nardwuar, the Canadian Interviewer was interviewing Tyler from Odd Future and surprised him with some old vinyl. Tyler lost his mind cause they were great old records. One of them was Alan Tew - i did a search for him and came upon the blog. Thanks for these links! Tip top, tip tip top ! Hey Simon, you got a cool blog here. Saw a Boy Katindig post and gotta say I like what you did. I'm from Manila as well. I'm watching him for the first time tonight at his own bar in our town (as he is based in the States now!)! He calls it "Where Jazz Lives". Let me know if you wanna have a ripped copy of his other album from the same era. One of his songs in that LP is a Paulhino Da Costa composition. Peace out keep spreading the love! Thank you very much for putting together all these great NER compilations! sets new standards for what is called "all killer - no filler"! I couldn't imagine, that this will work with only so few material of great Rhodes players such as Herbie Hancock, Chick Corea, Patrice Rushen, Crusader Joe Sample or Azymuth's Jose Bertrami - just my personal top 5 - but it just shows, how many wonderful music there actually is! wow! fantastic! thanks again! Wow, I have to say I am really enjoying this compilation! I don't know much about this music. Much of it sounds like soundtracks. Great stuff! I'm just learning about this music and these musicians. Is there any chance you could post the albums these are from once in awhile? I only downloaded this compilation as it was megaupload. I can't use the other file hosting services. Simon, thanks a lot for this compilation. I'm jazz-funk hunter and your place is one of my favourite music blogs on the net. Thank you for the new names. Whenever I'd listen to some music that had a warm, chill instrument playing, I could only make vague assumptions of what was making those sounds. After searching for some time, I stumbled onto a song featuring the same instrument loved but didn't know. The title was simply called "Fender Rhodes". I recognized the sound immediately. So now my on-and-off (mostly off) has led me here to your blog. I realize this comment may be too late, but thank you for sharing this great music with us. Best of luck to you. 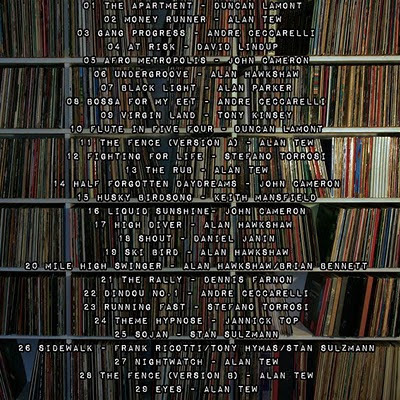 Man, I listened to the first sample - Duncan Lamont "The apartment" (mentioning the sweeney did it) and thought what!!!! I hope this comp is still up. Many Many thanks for the work man - loving it - (this is Library Music?? - who knew - hope your other comps are still up. Thanks for all this! I love Vol2, and it looks like Vol. 1 is not available. Is there a newer link to get Vol.1? Cheers. Hi Ricky Fry - the rapidshare link is active. amazing blog! I feel like i just found a lost treasure! could you re-up this? the link is dead. thanks and don't stop! Hi anonymous, glad you're enjoying the blog. The Rapidshare link in the first comment is working fine. Great blog. I found your blog while looking for Alan Tew music. This compilation sounds amazing. How can I get it? simon, it's the year 2013 and you keep up the good work! the prove of it is that we keep returning to your blog for amazing mind blowing tunes, keep it up buddy, you're doing an excellent job!! Wow, this album will become one of my favorite for sure. I've never listened to soul, jazz etc. before discovering your blog. This is now the third album I get, this music is changing my life, thanks to you. You are Blogger royalty no other way to put.. Withstanding server company shakedowns, your posts still deliver. I was disheartened (and honestly a bit musically depressed) by many of the blogspots that died. I LOVE library. can't stop listening. and this hits the spot. Keep doing it simon. Hey man love this blog so much stuff to learn! Waited up all night to get this comp but for some reason cant unzip. Tried stuffit and archive utility...any one have any advice as Im REALLY keen to check it out! Thanks in advance. DL links won't work these days, help a brother's ears out, thank you all! Your blog features some of the finest tunes and write-ups I came along in almost 50 years, feels like coming home (early 70s). Greetz from a little island somewhere in the atlantic ocean. Just friggin' amazing. The whole Internet is in your debt. Thanks David :) Drop a link here when you do. Looking forwards to listening to this, should help me power through some thanksgiving homework. Thanks for all the work you put into maintaining the blog and keeping the links up, and for sharing your musical taste. 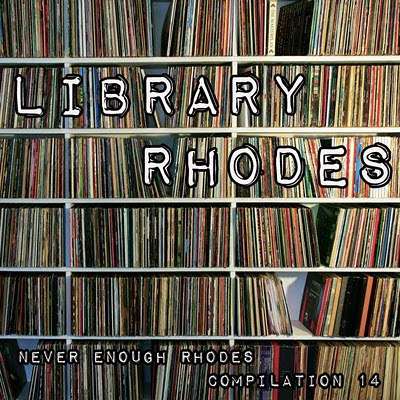 Love rhodes,but new to library,so I look forward to give this compilation a go.Thanks very much.